Welcome to Granite Mountain School! Granite Mountain 5th and 6th grade School offers the students in our community a very unique educational opportunity. Our school has been specifically designed to meet the unique growth and developmental needs for students of this age level. We’re able to offer a variety of choices and options afforded within a former middle school campus to our students. We have really focused on providing big school opportunities for our students while creating a small school environment. Through the expertise of our high caliber, professional staff, our students experience a STEAM-infused (Science Technology Engineering Arts and Mathematics) educational experience. Students will have opportunities to learn grade level content material, integrated with critical thinking and applied to real-world situations. In addition to our rigorous grade-level curriculum, we also offer an accelerated honors curriculum designed to challenge our highest performing students. At Granite Mountain, students are provided an innovative, character-rich education in a safe environment. They have the opportunity to explore band, general music, orchestra, choir, PE, art, computers, intramural sports, and a wide range of before and after school club activities. Additionally, our technology-integrated classrooms prepare our students for college and career readiness in the 21st century. 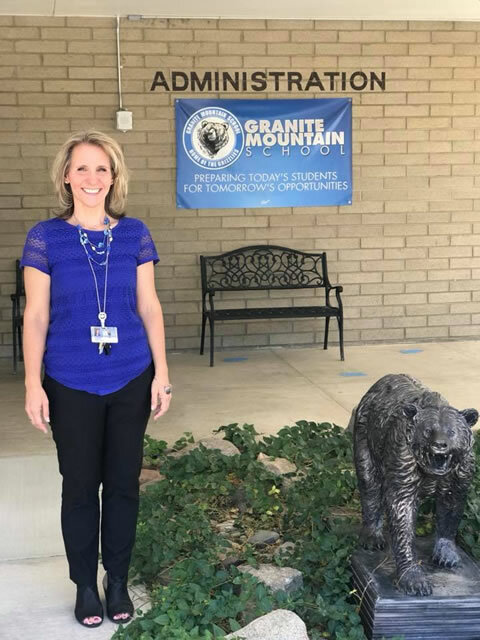 It is our sincere pleasure to be able to ensure that every student at Granite Mountain has the opportunity to learn and succeed at high levels with professionals who are focused on the individual needs of each child. We look forward to being a part of preparing your 5th and 6th grade students for their future educational success during their intermediate school years.